The goal of this chapter is to introduce carbon nanomaterials and highlight research focused on their use as cancer therapeutics. 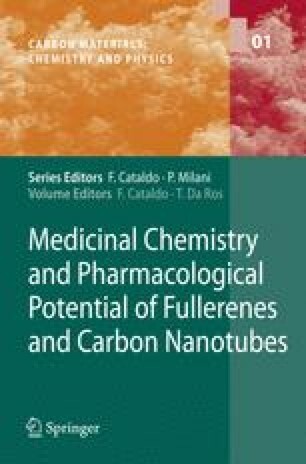 The physical properties of fullerenes and carbon nanotubes, including their spectral characteristics are described. Current oncology treatment regimes are described to provide an overview of where carbon nanomaterials may have significant value in further development of the established standards of care procedures. Photodynamic therapy and drug delivery using fullerene C60 is explored. Thermal ablation techniques using carbon nanotubes are explained and alternate hyperthermic methods using carbon nanotubes are described. Specifically, carbon nanotubes are examined for their potential contribution to the currently practiced clinical therapy intraperitoneal hyperthermic chemoperfusion. Nanotubes and nanohorns filled with chemotherapeutic agents are examined as are different methods for filling and containment of drug moieties. The attachment of active molecules to fullerenes is described with examples for use in oncology. Toxicity issues are explored and the future directions and potential for carbon nanomaterial types concludes the chapter.